Exotic plantings often mark the sites of historical settlement. In this case, a native Kurrajong survives near the house site on Portion 99. 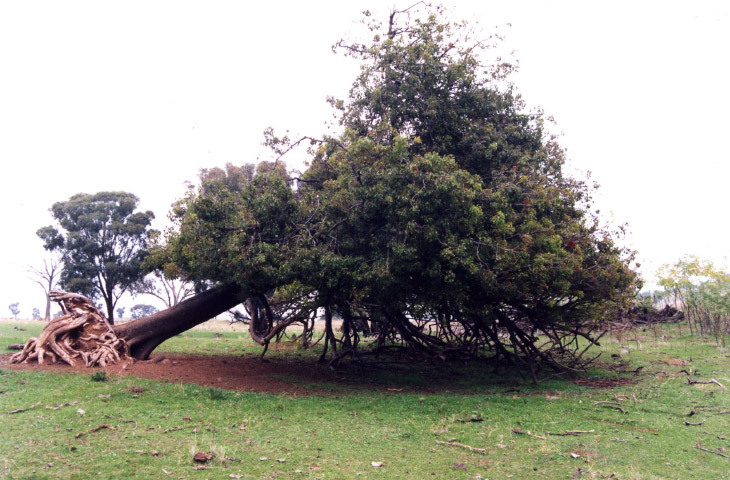 The tree was a useful source of fodder during drought (Edward Higginbotham, 1998). The process of amalgamation of small farms into larger and more economic units of over 1,000 acres was common in the nineteenth and twentieth centuries in the Central West of New South Wales. Tunbridge Wells, a farm of over 3,100 acres, located to the west of Cadia Village, is a representative example. The property started off in the late 1870s as a series of Conditional Purchases under the Robertson Land Acts, 1861. The acquisition of land in this area had been held back by the declaration of the Cadia Common in 1866, only revoked in 1879. Originally comprising 26 portions, divided up into a number of holdings, the land was gradually consolidated by a small number of more successful landholders. Set with the task of locating archaeological and other heritage sites on this large farm, it was assumed that each historical farm would have originally had its own farmstead. By following through the route of title and the process of amalgamation, it would be possible to predict the number of farmsteads and when they were made redundant by consolidation. John Grenfell let his Conditional Purchase lapse in 1880, so the hut he had built would have been empty by 1880. James Stedman, Andrew Ferres and William Patterson all sold out to Josiah Holman in 1891, rendering all three of their houses redundant, as Josiah Holman had a house in Cadia Village. James Lambert, Barrington Rothery and John Trathen all sold out to Theodore Blundell in 1906, making their houses redundant. The residence of Blundell has not been researched. All of these former farms were located by site survey in 1998, with the assistance of the previous landowner, Graham Brown. While all of the smaller farms were amalgamated into larger holdings, portion 84, taken up by Henry Hunt, had a strong relationship with Cadia Village, thus delaying its amalgamation until 1929. Following the route of title and amalgamation demonstrates two trends, first the amalgamation of properties into more economic units, relying on wool production, and second, how rural areas were once much more populous than they are today. The mechanisation of farms and the consolidation of properties have contributed to this depopulation. Sheep shearing is one of the last labour intensive farm operations to survive in the modern world. 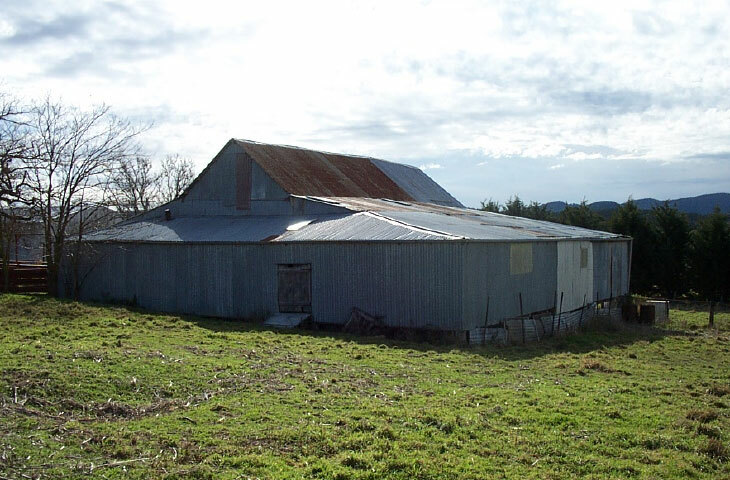 Woolsheds or shearing sheds form a typical element of this rural landscape. There appears to be a dichotomy between the more successful sheep graziers and other small farmers. Those who adopted subsistence farming, running a few cattle and pigs, did not appear to have the capital to enlarge their farms into viable economic units. Instead they had other occupations and careers, which provided enough income to support a family, but not the capital to expand their holdings. All the small farmers near Cadia, including the owners of Waringa and Tynan’s Slaughterhouse, eventually sold their land to the sheep graziers. In contrast, Te Anau is an example of a successful sheep farm and of a Cornish mine captain, turned landholder. The shearing shed on Tunbridge Wells demonstrates the importance of wool production. These buildings, often with three or four stands, form a characteristic part of the rural landscape (Edward Higginbotham, 1998).